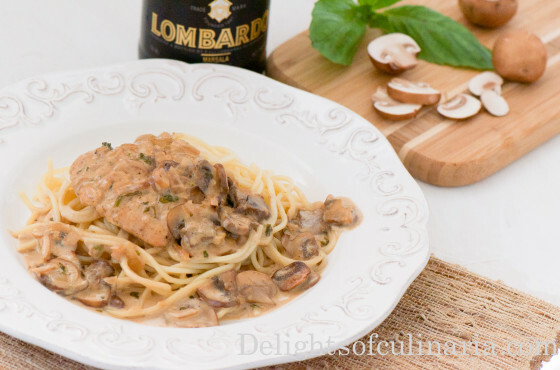 Chicken Marsala is an Italian dish made from chicken cutlets,mushrooms and marsala wine.This is a simply delicious and elegant recipe for family meal or perfect for any special occassion. *You can find parmesan-romano blend at Trader Joes. And you may add more cheese if you like. Replace heavy whipping cream for 1 cup chicken broth/stock and 3/4 cup marsala wine. Place chicken on a cutting board and lay a piece of plastic wrap on top. Pound chicken breasts with meat mallet,until they are about 1/4 inch thick. Combine flour,salt,pepper and parsley in a shallow dish. Heat 2 tablespoons of olive oil and butter over med-high heat using a sauté pan or large skillet. Dredge both sides of the chicken cutlets in the flour mixture and fry them on both sides until golden brown (About 5 minutes each side). Add another 2 tablespoon of olive oil and butter. Throw in mushrooms and onions in the pan and sauté until mushrooms are nicely browned and the moisture evaporated. Throw in basil or parsley. Add marsala wine and let alcohol evaporate.About 1-2 minutes. Pour in heavy whipping cream or chicken stock/broth. Transfer chicken cutlets back in the sauté pan with mushroom sauce and let it simmer for about 10-12 minutes. *stir in 2 tablespoons butter then add the chicken.only if adding chicken stock instead of heavy whipping cream. Serve with cooked spaghetti or your choice of pasta. Thank you Natasha,we love it! Thank you Lana for feedback.We love it! Hey, what could I serve this pasta with? Can you give me some ideas? Thank you. Most of the time I serve with pasta,but you can serve with mashed potatoes or rice as well.